I have developed a Snowflake unit to use with my third graders using the STREAM lens. These lessons will be done over a series of days when they visit my class. Since I enjoy having our students do STREAM projects in other Special Area classes, I asked our Media Center Teacher to share the story of “Snowflake Bentley” with students and they analyzed the story events with her. I also asked our Art Teacher about developing a Snowflake themed art project with our third graders so she will be doing this project in January with them. Here is a video of many highlights from the lessons! The S stands for Science or Social Studies and Self Directed Learners. The T stands for Technology and Thinkers. The R stands for Reading, Research and Reflection. The E stands for Engineering and Effective Communication. The A stands for Art, Adaptability and Academic Risk Takers. The M stands for Math, Movement and Music. Study the people who have been Snowflake researchers. Watch videos about them and be prepared to compare and contrast their work. Discuss Snowflake Bentley in small groups using the discussion cards found at this Freebie on Snowflake Bentley! I love the resources found in this Paid Unit on Snowflake Bentley that could be used with your class! Response: Create a graphic organizer comparing the work of two scientists who studied snowflakes. You could use a Venn Diagram or a Double Bubble Thinking Map. Create a Bubble map to include adjectives that describe snowflakes! In January, I will place a copy of Build a Snowman in our Google Classroom to have them creatively develop a snowman or snow-woman using their copy/paste skills inside of a great Google Slide Presentation found here then they will create a story about him or her and type it! Read this Smithsonian article to learn about the categories of Snowflakes that exist! Response: Create a Tree Map to categorize the types of Snowflakes that have been discovered. Engineering and Effective Communication: – Become a designer of code which will guide characters from the “Frozen” movie to skate in the shape of various snowflakes. Try to categorize the type of snowflake shape that you program the character to skate! Use the Frozen Hour of Code tutorial! In addition, my students loved using Winter Themed STEM Mats to create Winter Inventions using Legos! Art and Adaptability: – Use paper and scissors to create a snowflake using these directions. See if you can categorize it using the categories in the Smithsonian article which are on your Tree Map. Students can conduct a Math investigation by throwing cotton ball “snowballs” or larger cotton snowballs like these that I found at Target. They can throw it a few times, measure how far the snowball traveled and record it on a sheet. They can create math word problems with their data and share them in a Flipgrid that the teacher would create then solve each others’ problems!. They could graph their results on a bar graph or other types of graphs too! You can view my students’ Flipgrid responses on winter inventions by visiting this guest Flipgrid link. They could discuss Symmetry in snowflakes and use pattern blocks to create symmetrical snowflake designs! I really like this Movement lesson involving creative dance as if they are snowflakes falling and music! There are so many fun snowflake themed lessons that are great to do in winter! I hope you will enjoy framing your thoughts about snowflakes using the STREAM lens! Lindsay Petlak’s Scholastic Blog Post is full of awesome snowflake lesson ideas! Another resource which I’d like to recommend is this Paid Resource from Teachers Pay Teachers for additional lessons to go with “Snowflake Bentley”. I love to use Sphero robots in my lessons and really like this lesson on going through the engineering design process to have the Sphero act as a snowplow to move “snowballs” to a location in the class. I have modified this lesson a bit and am doing it with my 5th Graders using the larger cotton snowballs from Target and the Sphero Chariots! I am excited to implement this Snowflake STREAM unit! I hope you enjoy it too! Please let me know your ideas! I am thrilled to share projects done with my first graders based on the acronym of STREAM. You are probably familiar with STEM but the addition of the R and A put a new twist on STEM. Instead of just Science, Technology, Engineering and Math the R adds in the component of Reading while the A brings in Art! Here are some of my favorite pictures where students built artistic representations of the Statue of Liberty and used Legos to recreate famous landmarks mentioned in “Iggy Peck, Architect” by Andrea Beatty. Here is the specific link to the Podcast. I think that when we can provide students with the opportunity to construct their understanding of the world in a playful and supportive environment, we are leaning into their strengths and building positive relationships with them. They are learning how to be flexible and adaptable when they consider the ideas of peers while building with Legos or foam blocks. When they have to design a structure on a blueprint by painting it, they are using spatial knowledge and thinking deeply about design. As they sing, they are building neural pathways to connect the history of the Statue of Liberty with the Maker Days when they designed their own Statue of Liberty out of Play Doh, made foil or pipe cleaner sculptures or created unique crowns like the ones that the Statue of Liberty wears. My students have begun to be willing to accept a challenge and view mistakes as opportunities to learn and grow as they have been a part of the various STREAM projects. I love that they developed as effective communicators, self directed learners and academic risk takers who build on the ideas of others. Welcome to this week’s CMS Personalized Digital Learning Teacher Voice Podcast, Season Three, episode 15. My name is Lisa Maples and today we are going to talk about an effective strategy to frame lesson planning using the acronym of STREAM. I am going to share how I have expanded the STEM acronym to include an R and an A to create a new acronym of STREAM. The podcast will also include our Special Area team describing lessons that integrate STREAM. I am the Technology Teacher and teach one thousand one hundred children in grades K-5 each week. I enjoy infusing technology into my lessons, but I have now started planning lessons through the STREAM lens. STREAM is an acronym which has expanded from the original STEM acronym which means Science, Technology, Engineering and Math. STREAM has been used to identify lessons that are built around Science, Technology, Reading​​, Engineering, ​Art​​ and Math. The R and the A are inserted into STEM to make STEM embrace Reading and Art. In my expanded definition of STREAM, I have layered in our Learner Profiles as a part of Personalized Digital Learning in CMS. In my lessons, the S stands for Science or Social Studies and Self Directed Learners. The A stands for Art, Adaptability and Academic Risk Takers. The M stands for Math, Movement and Music. You might be wondering how I orchestrated a STREAM unit. Well, this year, in October, I reached out to first grade teachers and asked them what ELA Standards that they would be working on. We had a discussion and they sent me their nine week planning guide. I saw that they were focused on reading nonfiction, informational text. I decided that I could support their efforts by having students read and learn about famous landmarks in the world using the PBS Learning Media website. I also knew that in Andrea Beatty’s amazing picture book called “Iggy Peck, Architect”, that Iggy built a lot of famous landmarks. I asked our Media Center Teacher, Ms. Buncum, if she would share “Iggy Peck, Architect” with our first graders during their Media Center time while I shared information about famous landmarks with them during Technology Class. The S in STREAM refers to Social Studies or Science but specifically in this unit, it was connected to a Social Studies idea. As I mentioned earlier, we used the book, “Iggy Peck, Architect” by Andrea Beatty, as our inspiration. In this book, Iggy builds many different landmarks around the world such as the Leaning Tower of Pisa, The Eiffel Tower, the St. Louis Arch and the Great Sphinx. I had students listen to information about some of the landmarks. My students found the country of their landmark on tiny globes to give them an idea of where they live compared to where the landmark is located. The T in STREAM occurred when students created Technology Projects using an iPad app called Pic Collage. They also listened to articles found at http://www.Wonderopolis.org on iPads which they accessed by scanning a QR code to learn more about them and then built the landmarks out of Legos. In the N.C. Standard Course of Study, in the Writing Anchor Standard 1.4, it states this: “With guidance and support from adults, use a variety of digital tools and resources to produce and publish writing, including in collaboration with peers.” My students were able to collaborate and publish a digital writing piece that encorporated what they had learned using the Pic Collage app. The R in STREAM occurred when students Read and Researched The Statue of Liberty, a famous American Landmark. In the N.C. Standard Course of Study, the Reading Informational Text Standard 1.2 says that students will, “Identify the main topic and retell key details of a text.” Getting students to identify and retell key details is easier said than done! But, I did this with students while using digital text using http://www.pbslearningmedia.​org about the Statue of Liberty. In my opinion, the R that means Reading in STREAM can be considered anything related to Literacy such as Listening, Speaking and Writing. The N.C. Standard Course of Study Anchor Standard 1.5 of Speaking and Listening says that “Students will add drawings or other visual displays to descriptions when appropriate to clarify ideas, thoughts, and feelings.” I had them draw the Statue of Liberty in the Pic Collage app and type the information that they learned which was captured on our Brace Map Anchor Chart. The Writing Anchor Standard 1.2 from the N.C. Standard Course of Study says, “Students will write informative/explanatory texts in which they name a topic, supply some facts about the topic, and provide closure.” They were able to develop informative Pic Collage presentations about their Research of the Statue of Liberty. The E in STREAM stands for Engineering and occurred when students built famous landmarks such as the Eiffel Tower out of Legos and built bridges. In​ ​​my Connect Class in Technology on a Maker Day, they chose one of the famous landmarks that Iggy Peck had built and recreated it out of Legos. They practiced being collaborators and creatively thinking. We have a focus on the CMS Personalized Digital Learning Learner Profiles of being Creative Thinkers and Collaborators so this activity allowed students to consider the thoughts and ideas of a partner. It also gave them the chance to be kids and create with LEGOS which was so much fun! The A in STREAM stands for Art and Adaptability. On another Maker Day in my class​, students artistically represented The Statue of Liberty as they used materials like green playdoh, green and gold pipe cleaners, foil, foam spheres and paper plates. They became young architects of the Statue of Liberty! Once they had created their model of the Statue of Liberty, they took a picture of it with the iPad and inserted it into an app called Pic Collage. They typed the facts from a Brace Map that I had made into their project too. It is my privilege to get to teach with an amazing Special Area Team. I would like to share now how my colleagues and I planned with the STREAM lens. We call our Specials “Connect” because our special areas connect to each child’s experience as a learner. I have invited the other Connect teachers to share how we have collaborated on projects with first graders that integrated STREAM across the curriculum. In “Iggy Peck, Architect”, Iggy designs a suspension bridge to help his class get off an island using their shoestrings, sticks, socks, etc. Ms. Buncum, our Media Center Teacher, had kids participate in an Engineering Challenge by building bridges. Ms. Buncum​​: I gave them a graphic organizer to plan their own bridges. I then had them use 30 colorful popsicle sticks and 10 large binder clips to actually bring their designs to life. They were able to place their bridges on top of red plastic cups. They had a great time designing. She will share their responses and her reflection of this activity. Ms. Pylant​​, is our Art Teacher. Ms. Pylant, tell us how you were involved in “A” or Art part of this STREAM project. She will talk about having kids create Blueprints of a structure on blue construction paper where they made a grid with white crayons. They dipped small strips of cardboard into white paint then stamped the paint on to the blue print. She required them to design it so that the structure had support under it. She will share her reflections and what went well and what she might change for next year. LISA:​​ The “M” in STREAM in our case stands for Movement and Music. Mr. Cunningham is our P.E. Teacher who has children collaborate through movement to build amazing structures. He will talk about the Imagination Station Playground in the gym. He had purchased enormous foam pieces which children use to build a variety of structures after being given building challenges. By giving the children building challenges, it gave them a way to have hands on practice with designing a structure, collaborating, communicating and critically thinking. They were active and got to touch each piece to make their vision come to life. Ms. Proctor is our Music Teacher. She will share how that she built on the research that I had done with students on the Statue of Liberty and taught them a song about it. They were able to solidify important facts about the Statue’s history such as it being given to the USA as a gift by France. They were able to locate France and see where it is in relation to the New York Harbor area where the Statue of Liberty is located. They made a global connection between France and the location of the Statue of Liberty in New York City by learning the song. She has them closely read the lyrics to deepen comprehension of the text and then develop their musical sense by having them sing to a beat and enjoy music. They discussed more complex vocabulary like “immigrants” and how the Statue of Liberty was a symbol of freedom. Lisa: ​ ​Thank you all for sharing how you were a part of this exciting chapter with first graders! Our focus is on developing the whole child while empowering them to take ownership of their learning. The STREAM themed activities helped children apply information in productive ways to help them construct new and deeper understandings of the world. If you would like to get started with planning a STREAM project, first identify standards that you want to address and Learner Profiles to highlight such as being a “Collaborator”. Locate a picture book to share with students or a resource which can be referred to during the process. In our case, it was “Iggy Peck, Architect”, but you could use any text. In our case, the Special Area teachers decided to have children build bridges, paint a structure, make a model of the Statue of Liberty, sing a song about the history of The Statue of Liberty and creatively collaborate to build Imagination Station structures. The support of the Special Area team was critical to the success of this STREAM project, but you could start with just your class. Plan with your STREAM lenses on and you will probably discover an idea to collaborate on with another colleague. You can plan a Maker Day with a variety of craft materials like popsicle sticks, binder clips, paper plates, pipe cleaners, Play Doh and Legos, but start with what materials that you have. I love the book “Iggy Peck, Architect” so all of these ideas were inspired from that book. We know students engage more when they are connected to creative thinking and learning at a deeper level. I hope that you have been inspired by how the STREAM lens has shaped our thinking and planning for our students. Genial.ly is a site that allows graphic templates to organize thoughts, ideas, presentations. I created this genial.ly to organize my presentation on implementing STREAM in planning for instruction. I am sharing it in hopes that it will inspire other educators to use genial.ly for their instructional purposes. I have also shared it as my Google Presentation on “STREAMline Your Plans”. I hope you enjoy the easy maneuvering inside of my www.Genial.ly presentation and hope that you might create your own! I shared a lot of my lesson ideas on how to incorporate STREAM (Science, Technology, Reading/Research, Engineering, Art, Math) into my lessons with first graders. You can also access my school website to see more about STREAM at bit.ly/lisamaples. Visit https://www.genial.ly/interactive-content-education to see more templates! Recently I shared “The Dot” book by Peter H. Reynolds with my first graders. In this book, students use ABCya Paint to create a digital drawing based on one Dot that they make. I included some examples in this post. I just love the creativity that they showed in how one Dot can allow them to make a mark on the world! This activity highlights International Dot Day. Learn more at http://www.thedotclub.org/dotday/. This past Spring, my school district arranged for teachers to visit other schools to observe elements of Personalized Learning recently. I loved getting to see K-5 students sitting in flexible seats, conferencing with the teacher, working in small groups, reading around the room and being happy as self directed learners. One Kindergartener looked up at me as I passed him and his two partners who were working together on solving math problems. He smiled and exuberantly said, “We’re sticking together!” I was suddenly struck by his amazing collaboration and excitement to work with his friends until they had solved each problem! I loved to see examples of STEM bins in a first grade class which kids use to build structures using pattern blocks or other mat manipulatives. They pick up cards that are on rings which have pictures of structures in the world that they could build. How fun! The kids in each class in math workshop or reading workshop were focused and engaged on their activities. Some of them were working alone, in small groups, in partners or with an adult in a lesson at a table or on the floor. They were collaborating and had ownership of what they were doing. I didn’t see any child off task. They were all engaged and seemed very happy. In an effort to increase my understanding of Personalized Learning, I attended my district’s Personalized Learning Summit. It gave me excellent resources! The CMS Personalized Digital Learning Website has examples of information shared at the Summit! I love the Personalized Digital Learning Toolkit with resources galore! A Learner Profile has been developed by my district which you will find more about if you scroll down here. The Learner Profile articulates the characteristics of a learner. I hope you will take a look at it! It seems like that keeping learner characteristics in mind is THE PLACE TO BE! One of my favorite experiences with partners at the Summit was watching this video. In this Piano on Stairs Video, I noticed the way that people began to take the steps to allow them to make music together instead of taking the escalator. They weren’t just taking the stairs, they were navigating the stairs because the stairs had been installed so that music notes would play as their feet pressed the steps. They collaborated and enjoyed their time on the steps. As people who were about to get on the escalator saw people making music together on the steps, they frequently would decide not to take the escalator and instead, take the steps. I love that learning appears contagious in the video. This short video speaks to the fact that students will have opportunities to learn when conditions are inviting in classrooms! Another video about Ornie the Pig, is a wordless video. In it, Ornie sees cookies on top of a refrigerator and tries many times to get to the cookies. He reflects on what worked and what did not work. I look forward to showing my students this movie to prompt flexible thinking and a growth mindset as the school year begins. Self Directed Learners – I plan to use more Choice Boards, HyperDocs, rubrics to self assess, Pathways/Playlists. Effective Communicators – Meaningful dialogue will naturally happen as they work on individual and partner projects. Collaboration – Accountable talk will occur as they give feedback like in the piano video! Open Minded – Model and encourage different strategies to accomplish a task in Makerspace Stations. Receptive – They will do Active listening as they construct Thinking Maps and other responses to reading. Leaders – Jigsaw model – everyone has a job, model difference between being bossy and a leader, Label certain kids with strengths as an expert and encourage them to help others. Risk Takers – Be able to continue to have stamina after the “correction” process (editing), Try again if at first you did not succeed. Flexible/Adaptive – Create a safe environment in class. We respect all ideas and contributions from others. I love the ideas that my district has developed around Personalized Digital Learning. I am excited about continuing my journey as an educator and developing meaningful and fun experiences that kids will want to do and find memorable! My second graders loved designing robots out of pool noodles and craft supplies! They taped three pens on the sides and placed an electric toothbrush from the Dollar Store in the robot to power it on then watched as the robot wiggled on sheets of paper to make cool spirals or other abstract art! Here is the video of our process and a description of each stage of our design process below. 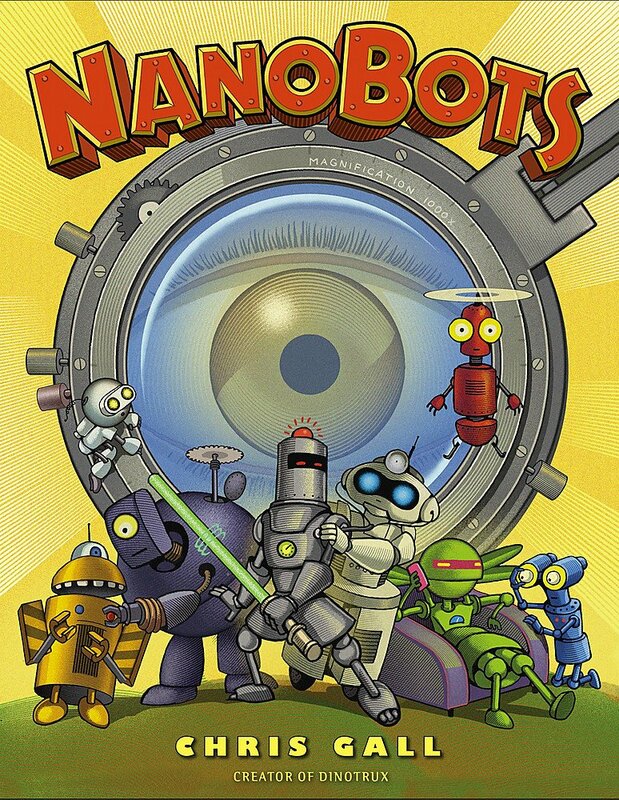 I read my students a book called “Nanobots” and showed them videos about the many and varied sorts of existing nanobot technology. They drew a design of what their robot would look like and be able to do. Their constraints were the following materials: 6 inch pool noodle strips, a battery powered tooth brush, googly eyes, Pom poms, feathers, pipe cleaners, glue, masking tape and three pens which they would tape around the bottom of the 6 inch pool noodle. I showed them a video sample to help generate ideas. They understood that they would have a prototype of a real nanobot. They could not make an actual nanobot with our materials but they liked planning their prototype! In the next session, they used the craft materials to make their robots. They inserted the tooth brush in the center of their foam noodle and turned it on to see it wiggle! They took a picture of it, inserted it into Chatterpix on their iPads and recorded themselves reading their paragraph. They were stored in a bin to wait for our next class. In the next session, they added three pens to the bottom of their 6 inch pool noodle and taped them on with masking tape. I had written their names on the bottom of each 6 inch section of pool noodles and gave them back to students in this session. I placed six pens on each table where partners worked and provided strips of masking tape. After I showed them how to attach the 3 pens to the noodle with masking tape, I showed them how to insert the tooth brush in the center of their foam noodle, turn it on to see it wiggle! The pens traveled all around a sheet of paper to make beautiful designs! They loved seeing their robot come to life. It took a lot of tries and a willingness not to give up to get the pens in the correct location so that the robot would draw spirals. Sometimes, the robot just drew squiggly lines. Since the toothbrushes came with cheap batteries, I would have to replace some of the batteries with name brand batteries if the tooth brush would not come on. Although I purchased 15 Dollar Store electric tooth brushes, sometimes they power button would not budge. This meant that students had to patiently wait their turns to get a tooth brush that would actually work. The joy that erupted with students when they saw their creation come to life was worth all of the time it had taken to organize these materials! I asked them to take their robot home that day to a spot in their world at home and think about how they can make a difference just like their pool noodle robot was designed to make a difference. During the next class, many of the students told me how that they used electric tooth brushes at home to make their robot work. One female student stopped in my class before school to tell me that she wanted to be an engineer and create robots when she grew up! I was so inspired by her and thankful that she had this opportunity to make and go through the design process. I started this journey at Dollar Tree buying batter powered tooth brushes and at Walmart buying 34 pool noodles, craft supplies, pens and glue. I former student of mine volunteered to cut each of the 34 noodles into 6 inch sections which saved me a lot of time. Her willingness to help me allowed almost 200 2nd graders to experience creating a fun robot and go through the design process. It was totally worth it based on my students’ excitement! I must admit, my shopping cart looked so unusual in WalMart back in March. I remember my excitement as I placed the pool noodles in my trunk along with craft supplies and pens! A local Dominoes Pizza store had just donated pizza boxes which I painted green for backdrops for green screen scenes using the Stik Bot app on iPads. That’s another post for another time! I know that my students will remember the experience of making a robot and hope you will enjoy the video of them doing it! Seeing the paint in blobs on my art palette, as mounds of potential, inspired me. My family participated in a relaxing evening of painting at our church. The leader, a graphic designer and artist, showed us the type of painting that we would emulate: a close up of a bike with a basket of flowers on it. The canvases were placed on each white table after we picked up our styrofoam palates. Step by step, the art teacher gave clear directions on how to paint the background with white and blue to appear as sky. Next, she had us sketch with chalk an outline of a bicycle but just the handle bars and front wheel with a basket on the handlebars. After our initial preparations, she directed us to use a large brush to paint a color of our choice on top of our chalk outline. I selected bold red but almost chose dark pink. Once the brush touched the canvas, there was no turning back. I loved the contrast of the blue background and robust red then we continued to sketch a basket on the handlebars. I painted a light brown basket then added white and dark brown lines to give it a woven basket look. As the next hour unfolded, we added black and white outlines to the bike wheel, painted multi colored flowers in the basket and began to see our masterpieces come together. Each person worked at their own pace as the teacher facilitated by modeling each step. She praised our effort and complimented each painter with specific comments like “What a great blue flower!” Or “I love your basket!”. We knew that our paintings needed our signature so each artist signed their pieces and pictures were made of our masterpieces. As the school year comes to a close, I am struck by the similarities of painting a personal masterpiece and my creating and facilitating lessons to help my students develop into better digital storytellers as well as confident communicators, collaborators, critical thinkers and creators. When the year begins, each teacher sees their units of study but by the end of each day and each unit, they have added more to each masterpiece, their students. By year’s end, they have offered the tools and encouragement for each child to develop into a learner with more strategies and fluency than they had before the year started. It truly is an amazing journey to use the teaching tools that I know to promote deeper understanding and application of concepts. I am not an art teacher, but as a Technology Teacher, I guide students to become better at using digital tools to enhance proper communication and digital citizenship. It is quite amazing to see children progress and continue to develop as learners and to see their mind masterpieces! It has been an amazing 25 years for me as a public school teacher in North Carolina. I know that I have not reached the end of my teaching career. In fact, I feel as if I am just getting started with promoting STREAM projects. I know though, that it is time to clean out and set Goals for the future. It is fitting to look at this school year as another masterpiece. I have included a picture of my finished painting masterpiece and a video with highlights from this school year! As I shared Maker Stations with a group of fourth graders last week, one of the stations would involve building a new ski resort in the N.C. mountains using KEVA wood blocks and calculating the cost. I showed the box of KEVA blocks and a girl raised her hand with a question that has continued to replay in my mind. She asked, “Is it hard to build with Keva blocks?” This question gave me a glimpse into her frame of reference. I knew that she had not had a lot of times to build. I knew that I must give students time to use the blocks with open ended opportunities to build a structure of their choice but also to give them STEM Design challenges in earlier grades to promote confidence as builders and creators. One way to have students build is after reading “After the Fall”, they could build a wall for Humpty Dumpty” to sit on with Keva Wood Planks! I read aloud the book to my first grade students and they LOVED it, especially the surprise ending where he transforms from an egg to a bird! The book has thoughtful scenes where Humpty Dumpty tries again and develops a growth mindset! Here are pics of my first graders building walls with Keva blocks and an Easter egg with a face drawn on it to represent Humpty Dumpty! After they built, they took pics, recorded their voice describing the wall and wrote a sentence using Book Creator app! I loved their creativity and collaboration that came about through this project. I noticed girls and boys diving into the challenge because it was fun to design a new wall for Humpty Dumpty plus they communicated so well as they recorded their voices describing the wall! They need time to design. No, it’s not too hard. What’s hard is trying to change the mind of a person who thinks it is too hard because they have had limited opportunities to build. I hope that my 4th graders will love getting to design and build a ski resort. They will become interested in designing, building, redesigning and sharing their ideas because of the time that I will make for them to become builders! Makerspaces seem to be everywhere these days! I like to see how different educators design spaces and provide materials for kids to have Maker experiences. I love the idea of giving kids materials at school which they can use to build and create. I would like to have stations similar to ones I observed in the Media Center at Cornelius Elementary recently. The librarian, Pam Lilley, calls her stations Maker Stations. The librarian applied for a massive grant (Belk Bowl and Lowes for a whopping $110,000) to allow her to redesign her Media Space with flexible seating and tables with casters to allow them to be moved for various purposes depending on the activity. Most of us will not ever be able to have $110,000 to redesign our learning spaces, but it is really not about the money. Her philosophy is grounded in an understanding of the whole child and how children learn best when they are self directed and have a sense of ownership about the activities that they complete. The students self check out books by scanning their book with a scanner into the school’s Destiny checkout program. It is an inviting atmosphere where kids interact with each other at a rotation of eight station activities in Grades K-5. The librarian shows video clips to explain how to use certain maker materials in January then for the next eight weeks, kids rotate to each of the eight stations. I got to observe her with a first grade class and will share pictures and a description of each station. The first picture below gives you a feel for the creative atmosphere with a green screen set up in a pizza box, Lego Wall in background and paper roller coasters! Tall tables with cool stools scream for children to come and make something! Keva Contraptions with Keva Planks – She directed the two students whose names were on the list for Keva blocks to go there. They designed an awesome tower with a place for a small ball to roll as a part of it. Sometimes she gives them Keva Challenges from the Keva company or other websites. Marble Maze group – She gave them a bin with marble maze materials. Make a Lego Duplo Architecture creation. Look through a stack of pictures and decide which Lego structure that you want to build. Chatterpix – She gave a direction. The character will need to have a face then put in Chatterpix app. They are given markers to draw on paper a character. Make a book mark out of Art Materials with brown paper. Little Bits STEAM circuit building – She told them that needed a few specific parts and showed them in the Manual Book how to build it. Osmo Station: She gave one group an iPad to use with the Osmo. Dash and Dot Coding Station – A Group uses an iPad to program a Dash robot. After giving directions for cleaning up, she gives each group a point or not a point in Class Dogo depending on how well they cleaned up. She lets them check out after looking at their class account on screen. For kids who were not checking out, she gave them a magazine at the table where they had been sitting. They all came back to their tables after self checking out their books and then begin reading with partners. She “genrefied” the books this past summer by putting colors of stickers on the binding of each book then when kids get the laminated sheet and they are looking for a fantasy book, they can go to the books with the fantasy colored sticker. How To Draw – She gives them drawing books and websites to see how to draw. Green Screen in Pizza Box. Use art materials on green straws as characters. Stop Motion Animation. A Ready Animator holds the iPad. Paper Rollercoaster – They make one Marble paper maze per grade level. She builds the cardboard base and lets them use paper to build the track. Teachers Pay Teachers has a seller who made Paper Rollercoasters which she uses to allow her to make copies of parts of the roller coaster in multiple paper colors. See http://www.paperrollercoasters.com. She does 8 week rotations from Jan. – March. She has 2-4 students in each group for each station which is an ideal amount. Each child rotates to the eight Maker Stations during the nine weeks. I noticed children who were totally engrossed in building, making, creating and designing. They conditions were set up for them to be successful in this beautiful library space! She has K-2 Stations and Grades 3 – 5 Stations but only runs them for one nine weeks. If students want to use the maker materials after the nine week Maker Station cycle, they can return to the Media Center to do so! In the Fall she does Digital Citizenship lessons using a variety of resources and teaches students to self check out books with the scanner in Destiny at laptop computers. They click on their picture in Destiny, scan their book and check out books themselves. After the Maker Station rotations which I observed which run January – March, she will do research projects with kids. A reward is given to children when they reach a certain number of points in Class Dojo where they go to the Lego wall and build. There were NO behavior issues that I observed! Their class time was over and they had interacted with appropriate voice levels and interpersonal interaction. She gets feedback by giving them a survey to identify a favorite center and she gets rid of not so popular centers. I am so inspired by the way that Pam has organized the stations rotations in the library. The kids were extremely engaged in working on their station activity for about 20 minutes then they read/checked out books for 15 minutes. I have Spheros, Lego Story Maker Kits, iPads, Chromebooks, Bloxels video creation kits, Lego WeDo 2.0 robot kits and Keva Wood Planks which I have bought using Grant Money. I will be able to implement some of the same type of stations using the materials that I have. I would also include Bloxels building challenges in my Maker Stations and STEAM challenges that relate to picture books! I am in a Computer Lab, but visiting this library with Maker Space Stations has certainly broadened my perspective on what is possible in how to manage a class of K-5 students with Maker Stations! For my students in the future, I would like to get Lego Duplo blocks, a Lego Wall, marbles for a Lego Marble making station, pictures on cards for kids to see of locations around the world for them to “create” in the Lego Duplo blocks, Makey Makey kit for kids to make music! Bongos is a simple Makey Makey project that she shows them and the Piano project, but they will find Pac Man and Flappy Bird. She used sponges with the Makey Makey and wet them if needed but not food to conduct electricity. She shows video tutorials at the beginning of the rotation cycle and I would like to curate some tutorials to show to train my students when we do station rotation. -Design technology-enriched learning experiences that encourage all students to pursue their individual interests, preferences, and differences. -Identify, evaluate, and utilize appropriate digital tools and resources to challenge students to create, think critically, solve problems, establish reliability, communicate their ideas, collaborate effectively. – Evaluate and appropriately modify the form and function of the physical learning environment to create a conducive digital learning environment. I will continue to remember the excitement that I saw on the faces of children that day! They love to participate in active learning!